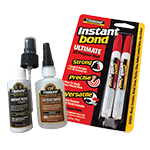 Bonds: Most common materials including: Wood, Ceramic, Metal, Stone, Plastic, China, Rubber, Leather/Fabrics, Glass & More. Wear gloves to avoid skin contact and protect work area from spills. Bonding surfaces should be clean and dry prior to adhesive application. 30 seconds. Longer is better. Handle in 30 minutes. Full cure in 24 hours.